For more than 20 years Philip Maignaut manufactures, provides and tunes steel drums (pan drums) in the South of France. Several years of research in mechanical production of steel drums, and experience by making traditional "pans", have been used to make the Spacedrum project. Using specific tools, we offer a full range of Spacedrum designed and assembled with great care from selected stainless steel sheets (special alloy), using some mechanical process. The tuning, it is an art. This know-how acquired along the years is a guarantee of quality that we can now produce reliable and sound instruments. Once our plates of steel are selected, we reproduce the manual stretching funds (stretching by hydroforming) in perfect proportions and surface conditions. After having trained and urged the sound-hole we are proceeding to a thermic and anti-corrosion treatment. Further work is done by pneumatic and manual hammering (dome-forming and notes, press ...) before the first tuning starts. The dome undergoes another thermic and anti-corrosion treatment and is tuned again. Finally, the two elements (dome and bottom) are assembled by welding. When these steps are completed, finishing come to punctuate a final tuning phase that validates the end of the process. The Spacedrum is then packed in custom manufactured box to be shipped without risk of being damaged. To ensure the Spacedrum production in France is to ensure the quality control and the monitoring. The full manufacturing process is easily controllable, from the purchase of raw materials to the finished instrument. Each Spacedrum is unique, fully manually granted, so this home-made work permits us to answer to special queries. The tongue drum, originally built from a propane gaz tank, has been improved by Elie Dacenko (Metal Sounds), designer of the Zenko, thanks to a close partnership with an Industrial subcontractor. While the manufacturing is processed industrialy, the tuning and the finishes are hand made. Each instrument is finely tuned with Linotune for a reliable and guaranteed result. The Zenko is the result of a successful collaboration between Industry and Arts and Crafts. An instrument 100 % made in France that proposes a professional quality affordable for all! To ensure the Zenko production in France is to ensure the quality control and the monitoring. The full manufacturing process is easily controllable, from the purchase of raw materials to the finished instrument. Each Zenko is unique, fully manually granted, so this home-made work permits us to answer to special queries. Until 2011 the Steeldrums were completely hand made in our own workshop by Metal Sounds, in a constant quality preoccupation. Today we're missing time to build the Steeldrums and the Spacedrums in the same time, that's why we decided to import the Steeldrums from Trinidad and Tobago where we've been personaly to settle all the details with our partners, among the best manufacturers and tuners of the island. Regarding the number of existing patterns we have decided to make choices. We propose what we consider to be the best formula regarding the visibility and the acoustic quality. Our patterns choices are a result of research and several experiments. All the "Classic" patterns can be done and we can also realize custom instruments (after a study). All the Steeldrums are tuned with precision and very carefully and they're all checked when we receive them. They're all checked with a stromboscopic tuner that analyzes all the frequencies. The ear of the maker added to that technology give a reliable result. 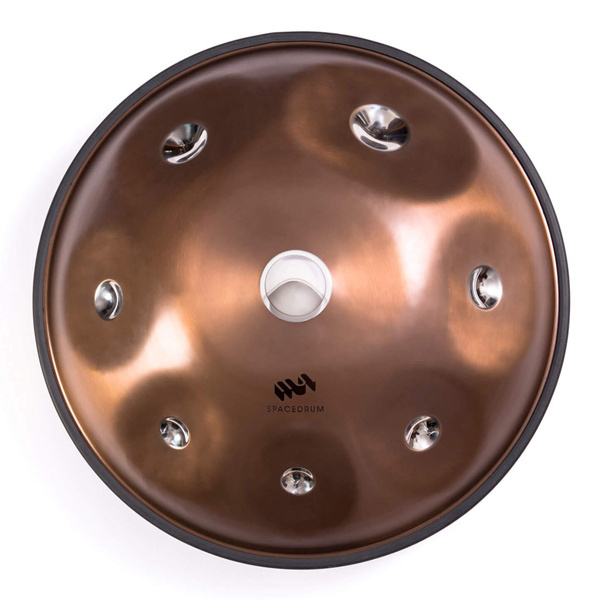 Thanks to more than 15 years of experience we can tune and re-tune almost any steelpan or handpan. Our workshop in France also guarantees our customers efficient and fast service, with adapted tools to repair and/or re-grant any instrument. Re-granting a Steeldrum or a Spacedrum costs between 70 € and 200 € maximum. We will do a specific study and an preliminary estimate for each case, we start the work after your validation.